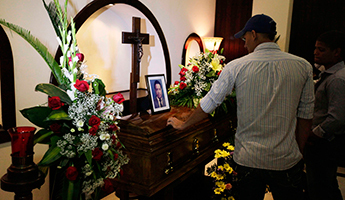 Friends stand next to a coffin containing the remains of Anibal Barrow, a television journalist, during his funeral in San Pedro Sula July 10, 2013. Barrow was kidnapped and subsequently murdered due to his coverage of drug-related crime in Honduras. REUTERS/Stringer. In 2009, when PEN International, the worldwide association of writers, launched a campaign to highlight the dangers faced by journalists in the Americas, Honduras wasn’t a primary concern. It wasn’t a place where reporters routinely faced threats, attacks or death for covering sensitive stories. Five years and dozens of murders later, that is no longer true. Today, Honduran journalists work in constant fear. A sobering report released today by PEN International, PEN Canada and the International Human Rights Program (IHRP) at the University of Toronto Faculty of Law details how the violence that has gripped Honduras since the ouster of President Jose Manuel Zelaya in June, 2009, has resulted in serious restrictions on freedom of expression. Honduras: Journalism in the Shadow of Impunity finds that threats to journalists are rarely investigated or punished, and that these failures in accountability are of a piece with the country’s larger struggle to address weak institutions and widespread corruption. Since 2003, 38 journalists have been killed, with accountability in only two of those cases. Most of the lethal violence has focused on radio and television reporters — journalists whose voices and faces are known to the public, and whose deaths are more likely to be noticed, to create a climate of fear. The sources of this violence are varied, and often involve the transnational drug cartels that have infiltrated Central America in recent years. But violence is produced by the state, too, most notably by a corrupt police force. Successive failures to reform key institutions and to purge the police force have undermined most efforts to tackle the crisis of impunity. Attempts by international bodies such as the Inter-American Commission on Human Rights to protect journalists via “precautionary measures” directed at the government of Honduras have met with little success. Journalists have learned to steer clear of sensitive topics such as corruption and drug trafficking. This has distorted the role of the press in much the same way that similar violence silenced my colleagues in Mexico, where attacks against journalists that originate with the state, or organized crime groups, are becoming the rule rather than the exception. In 2013, according to the Committee to Protect Journalists, Mexico’s impunity rate for violence against journalists was one of the highest in the world. Despite the government’s triumphalism about crime reduction, press freedom is still under siege in the northern state of Tamaulipas, where after seven years of armed conflict, self-censorship is rife among local journalists due to the fear of assassination. Though crimes against reporters were made a federal offence in 2012, this legislation was passed without accompanying resources for effective enforcement. Some of Honduras’ systemic flaws seem obvious enough: In 2012, the 16 prosecutors at the understaffed and underfunded Special Prosecutor for Human Rights were “nominally responsible” for 7,000 cases. On the other hand, there are several agencies whose overlapping responsibilities have created a situation where institutional responsibility “has been so widely diffused that no one is ultimately accountable.” Some of these problems could be solved with better funding and limited institutional reforms. Greater transparency about current investigations into the cases of murdered journalists, for example, would be a helpful start. Canada has important economic and political ties to Honduras. In November 2013, Canada and Honduras signed a free-trade agreement, and Canada provides significant monetary and technical assistance to Honduras every year. We have a valuable role to play in calling for greater accountability for human rights violations in Honduras, and for the protection of freedom of expression and working journalists. When President Juan Orlando Hernandez takes office on Jan. 27, the Canadian government should make clear that we stand in support of at-risk journalists and activists, and all those who no longer wish to see the crimes of the past translated into the crimes of the future. Luis Horacio Nájera is a Mexican journalist who came to Canada as a refugee in 2008. In 2010, he received the International Press Freedom Award from the Canadian Journalists for Free Expression. He is currently a masters student at the Munk School of Global Affairs.